19-21 April, Year 13 Aq. Of course, we do not normally have a Kick-Off Party for the Lustration of the Ancestors, however this is a special year. This year's Lustration of the Ancestors is to be held in Capetown, South Africa, hosted by Rt. Rev. Raene Packery and the Clan of Kheper Temple -and we are very much looking forward to it. However, we know that many people in the US who normally attend Lustrations will not be able to join us in Africa, so we augmented this year's festivities with a Kick-Off Party, so that they would still have an occasion to gather and wish Lady Raene well before the actual Lustration. The event began on Friday afternoon with opening comments from Chancellor Rev. Don Lewis. This was followed by a phone call from retired First Priestess Lady Krystel, and comments from Lady Janice. ​Prominent at the event was a display about the Interfaith Library Project. Rev. Laurie Denman had spent several months previous working on a book drive and fundraising to create a Pagan Interfaith Library in South Africa, to be curated by Lady Raene and the Clan of Kheper Temple. Rev. Laurie had gathered hundreds of books, DVDS, and other items to establish the Library, so that South African Pagans can have access to real-time materials that they do not otherwise have easy access to. Rev. Laurie and her team did an outstanding job with the African Book Drive! Congratulations Rev. Laurie and everyone involved on a job well done! ​Also during the opening comments Rev. Alyssa Maxon presented heraldic banners to the host groups, bearing their Temple Sigils. Thank you Rev. Alyssa! This was followed by a workshop dealing with Egyptian hieroglyphics. After discussing the nature, use, and history of hieroglyphics, attendees were able to create personal medallions with their name or other word of their choice in hieroglyphics. It was a lot of fun and people displayed a great deal of creativity. 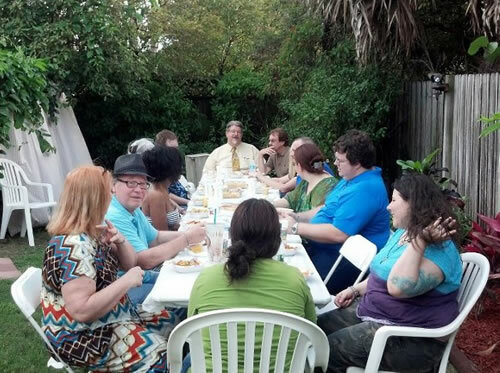 After this followed an open air feast in the gardens of the Boynton Beach Campus of Children of Gaia Temple. As night fell we assembled for initiations. At most Lustrations numerous initiations are held, but as this was a kick-off party for a Lustration we had only one initiation -Rev. Laurie Denman, who was initiated into Second Degree. Congratulations Laurie! Officiating Clergy included Rev. Don, Elders Rev. Stephanie Neal and Rev. Terry Power, High Priesthood Rev. Janice Christian, Rev. Rick Keen, Rev. Angela Munn, and Second Degree Clergy Rev. Mike Neal, Rev. Alyssa Maxon, Rev. Liz Hamilton, Rev. Angela Grimes and Rev. John Grimes. Saturday morning we assembled at the Lake Worth Campus of the Children of Gaia Temple. 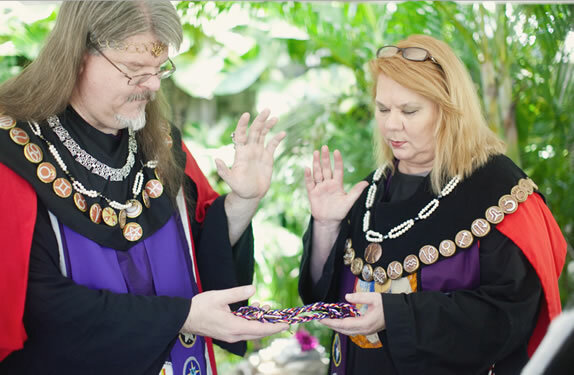 Friday's events had been held in Boynton Beach to allow the Lake Worth facility to be decorated for the handfasting of Rev. Terry Power and fiancee Angie. A large tent had been erected in the garden and bedecked with flowers. Altars were set up at the quarters and the main altar before the fountain on the garden's west wall. 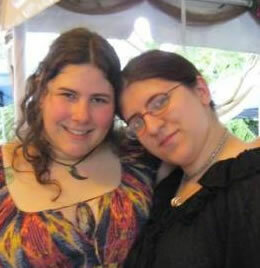 ​The ceremony, a formal Correllian handfasting, was officiated by myself, Rev. Don Lewis, and Lady Stephanie. Rev. Terry was joined by his son Anthony as Best Man, and bride Angie was attended by her daughter and niece. Rev. Terry's daughter acted as ring bearer. Rev. John Grimes, Rev. Jeff Lionheart, Rev. Angela Munn, and Rev. Alyssa Maxon acted as Quarter callers. Rev. Alyssa also acted as Besom Mistress. Rev. 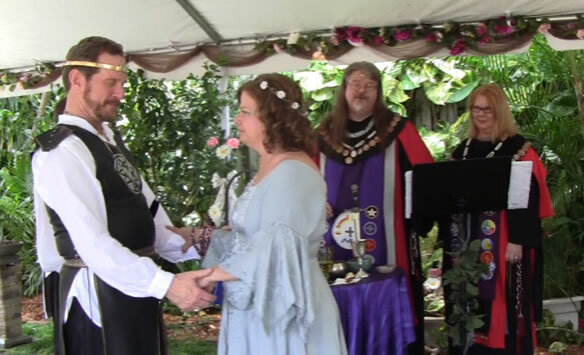 Don and Lady Stephanie bless the handfasting cords during the ceremony. ​The couple's daughters invoked the spirits of their respective Grandmothers, and made floral offerings to them. The couple created a Unity Jar comingling differently colored sand with sea shells, shared a single cake and single cup, exchanged rings, made vows, were handfasted, and jumped the broom during the ceremony. Perhaps most beautifully, the couple's rings had been inscribed with a single poem split between them so that they would only be complete when together, like the couple themselves. 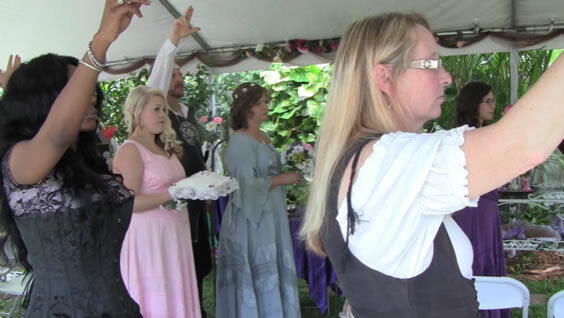 Invoking the Quarters during the handfasting ceremony, with the bride and groom at center. ​It was a lovely ceremony -congratulations Terry and Angie! After the ceremony chairs were cleared away and tables were set up for the feast. The feast was catered by Taste Of Africa, providing authentic African cuisine in honor of the location of the upcoming Lustration, and followed by a tower of cupcakes created by Rev. Liz Hamilton. Rev. Terry and Angie, wrists bound, being pronounced husband and wife. ​Many gifts were given and guests used metallic markers to write good wishes on stones for the couple. Finally the tent was turned into a dance floor, with Rev. Rick Keen acting as DJ. However, being a Correllian event the dance floor soon turned into a drum circle. Sunday everyone assembled for the final day of the event. The day began with a brunch featuring sushi, sandwiches, and many tasty deserts. ​As afternoon progressed to evening the number of guests gradually diminished as people slowly departed to begin their journeys home, but the party continued until well after dark. As always the event was a great joy, with much pleasure in seeing old friends and making new ones. Everyone joined together in sending good wishes to Africa! Rev. Denise Scott, Rev. Chellie Battles, and Rev. Angela Newell Grimes. 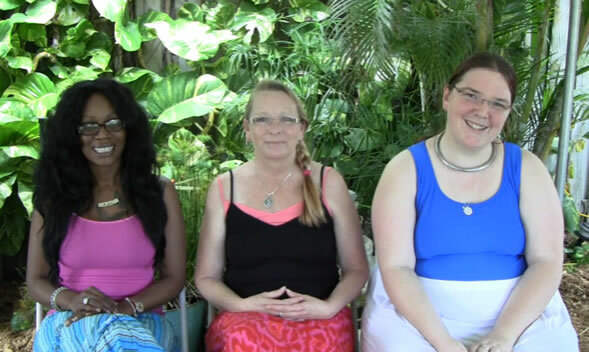 ​Many thanks to Lady Janice and all the members of Children of Gaia and Sacred Light of South Florida Temples, and Lyr’s Children Witan Shrine –Rev. Janice Christian, Rev. Rick Keen, Rev. Angela Grimes, Rev. John Grimes, Rev. Chellie Battles, Rev. Jeff Lionheart, Rev. Denise Scott -all of whom worked VERY hard to make all of this joy possible! What a wonderful, loving family you have! Thanks also to Cyril, Dave, Julia, and Elise. People have no idea how much hard work goes into an event like this until they host one, but I can tell you it is a lot of work.